Have you ever stopped and really taken a look at your trade data? Are you confident in your ability to trade consistently? Are you profitable over the long term? Honestly, most traders aren’t. It’s not because they’re not picking “good” stocks or placing good entries, it’s because they’ve never stopped to take a deeper look at their risk to reward. There are three primary ways I come up with new topics for this blog. First and foremost, are suggestions from you, the reader. Second, interesting things I come across in my readings (some trading related and some not), and third, by sifting through my old notebooks and trading logs to find things “clicked” for me in my trading, I call these “light bulb” moments. One of the biggest “light bulb” moments occurred when I started to look at all my trades in terms of risk and began to factor in R-Multiple and Expectancy. I spend a lot of time analyzing my trades, but at the beginning, I was more focused on where my entry may have failed, or how I could optimize and add parameters for better entries. After rereading Van Tharp’s book Trade Your Way to Financial Freedom, I was reminded that entries just aren’t as important as people think. It’s true the smaller the time frame, the more precision is needed when placing trades, but over the long term the effect your entry’s have on your results is not a factor of where you enter, it’s how you exit. I only trade trades with favorable reward to risk ratio. What’s favorable you might ask? Well there are really three factors that tell you this and they all stem from your system’s expectancy. Expectancy is simply the average amount you can expect to make. There are a couple ways you can calculate this, I use (Avg. $ W x Win %) – Avg. $ L x Losing %). So (200 x .45) – (75 x .55) gives you an expectancy (or average profit per trade) of $48.75 less commission and slippage. You can also take a look at your R-Multiple for each trade, add them up and divide by the number of trades in your data set to get your expectancy in terms of risk. In order to look at your trades in terms of R we want to determine what your risk per trade is. If you’re risking $100 per trade then $100 = 1R, if you make $200 on a trade you have a +2R, if you lose $50 on a trade you have a -0.5R. Adding these together and dividing by 20 gives you your expectancy in terms of R.
Notice the system only has a 40% win rate. Win rate is important, but is not the be all end all. Meaning for every dollar you risk you can expect to make $0.44. So for every $100 at risk you can expect to make $44 (on average). Obviously the more data you have in your statistical set the better, but this should give you an idea of the power of looking at your system in terms of R.
The entry is only a small factor. As individual trades we need to be able to hold onto your positions long enough to see those bigger R returns of 2, 3, and 4x +. How often do you trade (frequency) and much do you pay in commission and slippage? These important factors can turn a positive expectancy into a negative one if you’re not careful. 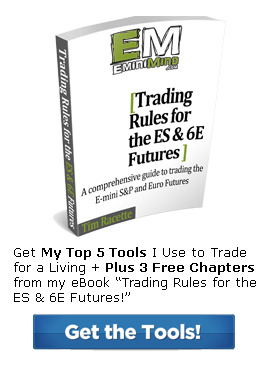 Let’s say you trade the futures markets and pay $5.00 per round turn and rarely have any slippage when getting in and out of your trades. Now it’s time to factor in your “opportunity”. 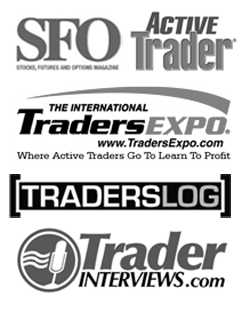 On average how much can you expect to make per day or per week based on the # of trades your system fires off. For example if you place 40 trades per month and have an expectancy multiple after commission of 0.39 then your expectancy per day would be 0.78 (40 trades / 20 trading days per month x .39). In other words you could expect to make $0.78 for every dollar risked, or $78 for every $100 risked. Keep in mind this is on average, some days will be more some will be less. I’ve spent a lot of time studying what leads great people to their success. I even did a presentation on the topic at the 2013 NY Traders Expo called 10 Steps to Developing a Winning Traders Mindset. In my post 12 Characteristics of Highly Successful Traders I outline commonalities I’ve found among winning traders. Van Tharp has a shorter list of 10 that I find accurate as well. They have a well-researched, positive expectancy system. Their system fits their personality, beliefs and objectives, and concept they are trading. They understand that they must predefine their worst-case loss before they enter into the trade. They think about each trade to determine the potential reward-to-risk ratio. They have a business plan to guide their investing. They understand that position sizing is key. They spend a lot of time working on themselves and use their trading performance as a benchmark for how they are doing in their self development work. They take total responsibility for their own trading results. Finding high r/r opportunities is similar to a cheetah stalking its prey. While the cheetah is the fastest animal on the planet it does not gallivant around the savanna chasing after every gazelle that comes its way. Instead, it waits stealthily in the grass for the “easy” prey (The young wounded gazelle that has strayed from the heard). This yields him with the highest reward to risk. As trades we need to wait patiently for not only our setups, but the best setups with the highest reward to risk ratio. Only then do we place our bets and let the numbers do the rest. If you’ve become frustrated with your trading results and can’t seem to make money in the markets it’s not because your entry’s are no good as studies show that with good reward to risk ratio’s, controlling your position size (keeping your positions small), and holding onto your winners long enough, even random entries can product consistent profits over time. Over the years many things have played an important role in my trading, but most importantly the position sizing and risk control measures I employ are the two factors that have made the biggest difference. …this is just plain incorrect. It’s mathematically impossible. I’d be interested to see these studies! So you have E=0 before costs which ends up being E=0-(spread+commissions). I’d be interested to hear your take on this and any material (with the statistics!) to challenge this idea. There have actually been a lot of studies and statistical evidence to prove this including Paul Samuelson’s paper on Random Walk Theory along with Van Tharp’s more recent works. I’m not suggesting to blindly pick your entry’s, rather to show the importance of position sizing and sticking with winners while cutting losers. Thanks for another great article Tim! I check this website almost every day I’m constantly studying everyday. I have not yet made the plunge into the market but have had a practice account for a few weeks now with Infinity. You bet Matt! Let me know if there’s anything I can do to be of help. Terrific article Tim. You are very thorough in your trading education. I really appreciate reading your blog. Keep it up! website. It seems like some of the text within your posts are running off the screen. Hello tim, would you say 2 points in es per day is awesome profit? May i ask what your average profit pts per day is? Yeah averaging 2 points per contract per day is a great goal. One thing I’d caution you on though is that it’s an average. Rarely do I have a week that I make 2 pts every day. It’s usually made up of a couple small days, a scratch day and one or two bigger days.